All this to say I really love this story arc, and especially this book. I hope you do to! It released on August 28, and the presale link is live here. Do you need to catch up with the first three books? Well, I have a little surprise for you. This weekend only on Amazon, you can download the first three books for free, beginning at 12 a.m. on Saturday, August 18. This will be the last time all three books will be free, so grab the deal! OK, all that said.... are you ready to see the cover!? I'm very excited to announce that in 2018, I'll be joining the awesome indie house, Snowy Wings Publishing! 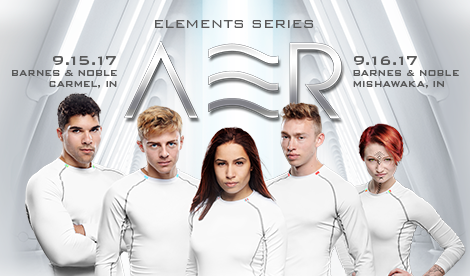 Starting this month, the first three books in The Elements series will feature updated covers, a brand new prologue in AQUA, and an exclusive sneak peek at IGNIS, Book Four, at the end of AER. If you'd like to be one of our insider crew to reveal the new cover (on 1/17 for the release date 1/23! ), please sign up here! Looking forward to new adventures with a great new team of middle grade and YA authors! Happy New Year! I know. Welcome to my world. This is how writing became the middle child for a little while...imposing order with sheer will takes its toll, and something had to give. I put off outlining IGNIS whilst in the throes of puppy-momming, and wound up having to shelve the first 7,000 words I wrote a few months ago since they just weren't working. I've replaced them (*bows before the NaNoWriMo accountability throne*) and am happy with the new direction--you guys, Arco and Jazz are narrating! We're looking at 50K words or bust by the end of the month, and I'm on a mission now that the outline is done too. My formal goal is to have the first draft finished by January, which would be a record. I've always felt that Stephen King's do-the-work-day-by-day process is the best one, at least for me. If I only wrote when I felt like it, I'd never get anything finished. So, bring on the coffee and epic movie soundtracks--we have a war to write! It wasn't as busy as last year's Indy Comic Con, likely because it was over Easter weekend this time, but that didn't stop old and new friends from coming to see my panels on character authenticity in YA Lit! I was genuinely humbled to see so many people show up, especially at 10:00 a.m. on Easter Sunday! We had an awesome time, and honestly, getting to meet people who share the same passion I do for creating worlds is one of the best things about this event. The other best thing? The super cool cosplayers! Have a look at some of the new friends I made, as well as a few old ones from years past, whom I was happy to see again. See you next year, Indiana Comic Con! We also had a drawing for an Elements Series prize package, which came with a Cosplay photo op in the actual gear the characters wore on the trailer and studio sets for TERRA. The winner was this lovely lady, Jillian! In other news, I'm excited to be coming back to Indianapolis next week for the Carmel HS Creative Writers' Con and book signing at Barnes & Noble! If you're in the area, be sure to stop by the Greyhound Plaza Barnes & Noble starting at 7PM for discussions, free swag, and the chance to hang out with a bunch of awesome YA authors! This is one of my favorite events of the year, so I hope to see you there. If you can't make it next week, I'll be back on March 24 and again on April 14-16 for Comic Con (details to come; please check the "Appearances" tab above for updates). I'll have TWO panels at the latter, and I'm super excited! If you haven't signed up for the VIP Newsletter yet, please check it out here (just saying, I told those guys what the new book is about!!!). In the center, the only way out is through.